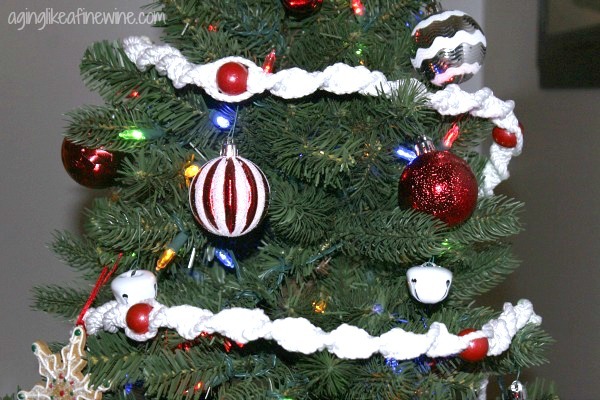 Adorn Your Christmas Tree With This Unique Macrame Garland – DIY Blog Challenge! At the end of last years Christmas season, it was time to say farewell to our old Christmas tree. My husband was tired of wrestling with it each year to put it together, hold it together, get the lights to work and so on. That meant a new tree for this season. We went looking for a tree and picked out a small, 5 ft tall tree. We chose this tree because of next years retirement plans which include selling our house and probably living in a 5th wheel for awhile, but that’s a different story. So anyway, we bought this little tree so it would fit wherever we happen to be next Christmas (hopefully!). 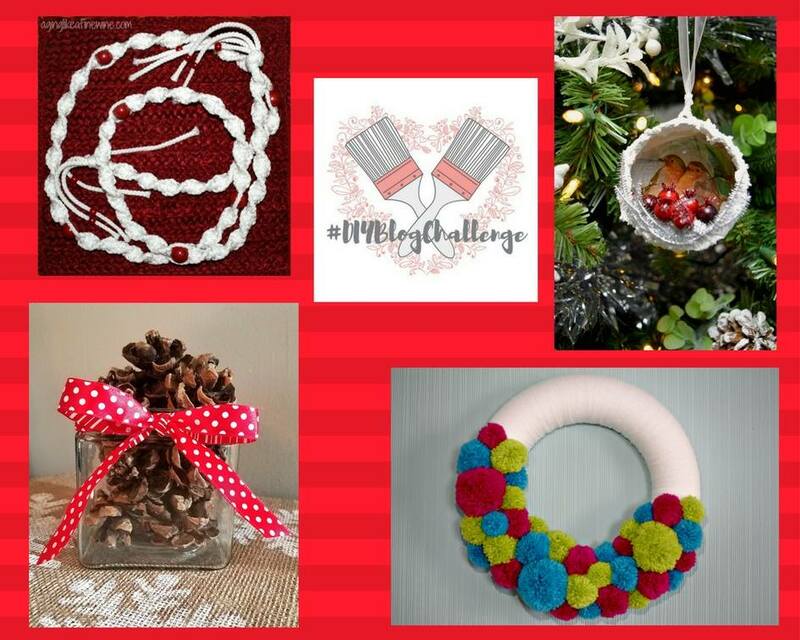 The bloggers participating in the DIY Blog Challenge were challenged this month to create a Christmas decoration. I needed to decorate my little tree and I needed a DIY project, so I decided to make a macrame garland for the tree. 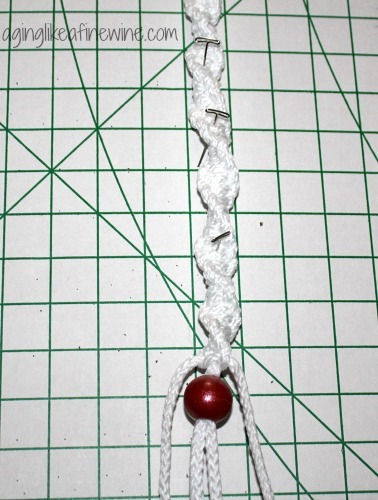 Cord – I used Bonnie white macrame cord which I always find at Hobby Lobby or Amazon. For a more rustic look, go with jute! Beads or bells, something that can be strung on the cord. I purchased round wood beads at Hobby Lobby. First I had to paint my beads because I could not find any red beads with holes big enough for the cord I chose. My husband placed them on a dowel suspended from his workshop ceiling and spray painted them for me. 2. For an eight foot garland, I cut the two tying cords each 34 feet long and the two center cords 14 feet. 3. I tied the four cords together with an overhand knot. 4. 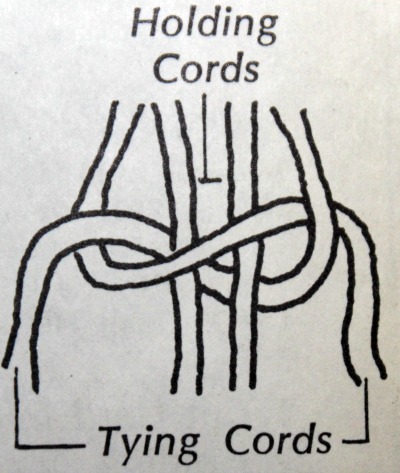 Pin your cords at the knot to something to hold them down. I have an inexpensive cardboard cutting board that I found in the sewing section at Walmart that I use for this. 5. Start tying half knots! 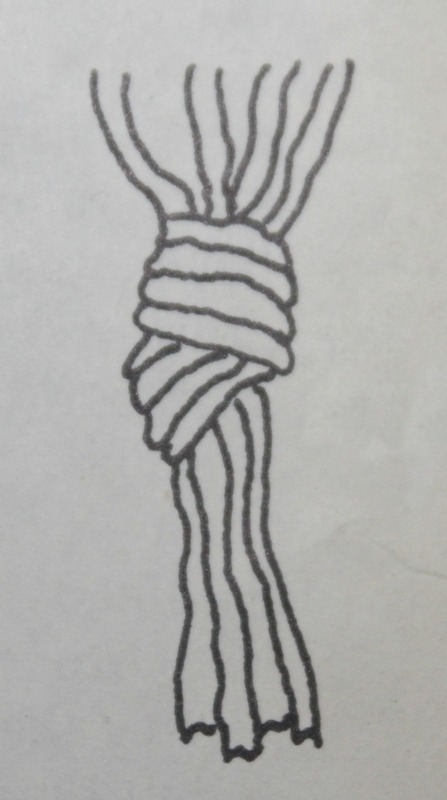 This is the only knot I used in the garland. 6. Place the beads on the two center cords at the spacing you determine. I placed my beads 10 inches apart. 6. When the garland is the length you choose, cut the cords leaving enough cord to tie an overhand knot and still have a tassel. 7. 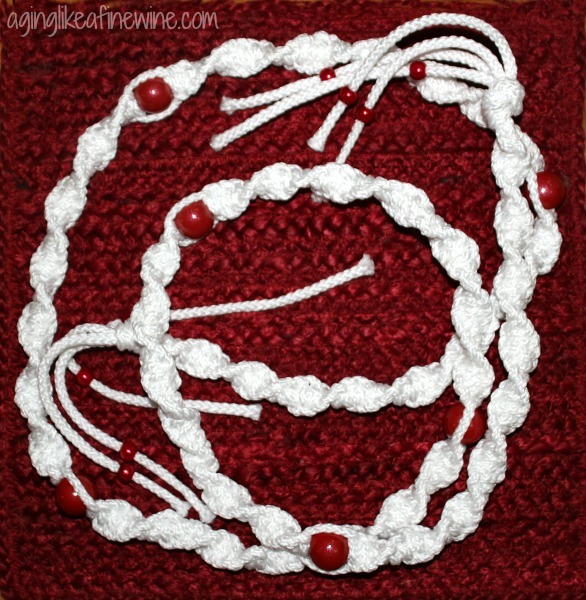 Last, I placed small red beads on each of the four cords making up the tassel. This was very easy to make and would be a great way to venture into macrame if you’re new to it. I placed my garland around the top of my little tree and it looked very nice. For this 5 ft tree, I will need a minimum of 2 more 8ft garlands, but 3 would provide much better coverage. I then tried it on the wall we re-decorated this summer (you can read about that adventure here). I found it looks good here too. And for this year, even though I intended it for the tree, it may just reside here because I don’t know whether I’ll have time to get more made! 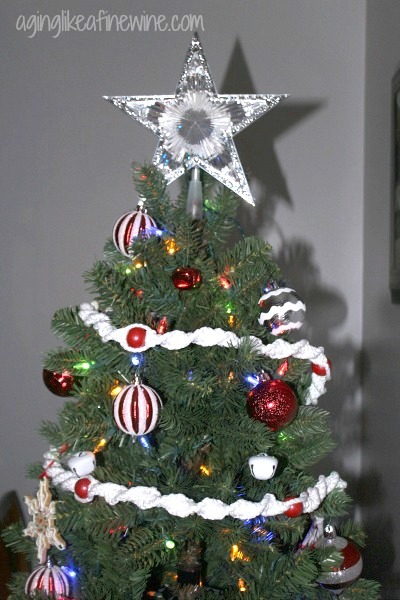 It’s a very versatile item and could be used to decorate anywhere in your home or outside on a covered porch. Do you macrame and if you do, what are some of the things you’ve made? 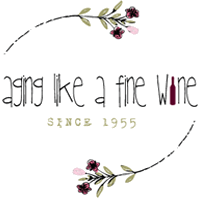 Thanks for stopping by Aging Like a Fine Wine today! Have a wonderful, blessed Thanksgiving! I’ll be sharing this post on some of the lovely link parties found on my where I party page. The link below is an affiliate link. That just means if you click on the link and end up making a purchase, I get a small referral fee at no extra cost to you. And I would very much appreciate it! Thank you Joanne and thank you so much for stopping by. Do you macrame? That looks beautiful on your tree! 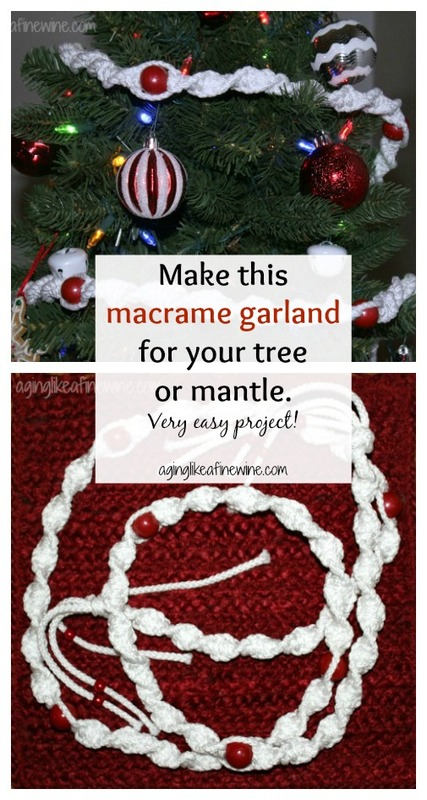 What a great idea to make macrame garland! My garland got destroyed by mice this year so I think I’ll give this a try. Thank you Cassie. It’s something a little different and it is pretty! Thank you Evija! 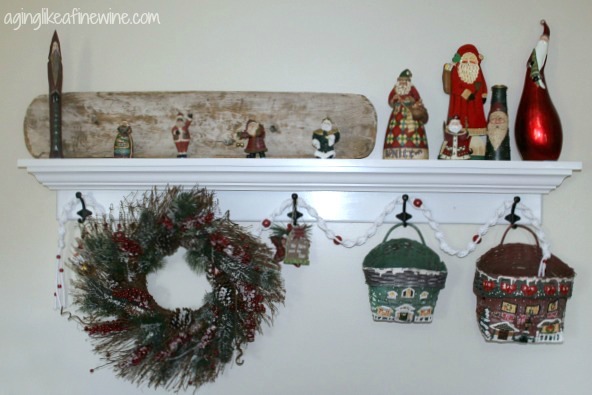 It’s very easy and you could use it in lots of ways to help with your Christmas decorating. Thank you so much for stopping by! Thank you Lianne! It really does provide lots of possibilities. A rustic tree with a jute garland would look great. Thank you for stopping by!